Our swimming pool nets are proudly Made in the USA. The Pool Netr™ is a high-quality pool net and leaf-catcher manufactured with a durable, injection-molded polypropylene plastic frame, and with a strong aluminum wire-mesh screen. Each frame has a 3 yr. Limited Manufacturer's Warranty (netting excluded), and we stand by every product we sell! (Pole not included). Patent pending. Our brand new colors! This is our Seafoam Green Pool Netr™ and we just introduced this color to the world first at the International Pool | Spa | Patio Expo. MSRP $29.95. Available for purchase here! And this is our Swimming Pool Blue Pool Netr™! MSRP $29.95. It will go well with any swimming pool and it also is now available for purchase here! 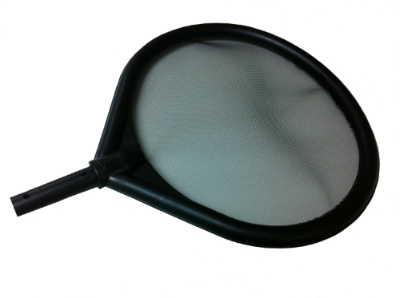 The Pool Netr™ with Stainless-Steel Screen (BLACK) Our standard product. With a tough and durable screen, this pool net should hold up great to usual wear and tear. (3-Year Limited Warranty on the frame). MSRP $29.95. The Pool Netr™ with Aluminum Screen. Quantities are LIMITED (ONLY 50 REMAIN!) MSRP $24.95. BUY NOW FOR $12! During October & November, we're DONATING $2 to STANDUP2CANCER.ORG for every Pool Netr™ purchased! Our story is a simple one: Our swimming pool net is something completely new. The shape is new to the market; our materials are high-grade and superior; and we know we have something that will give you years of use and satisfaction. In the end, that's really what it's all about. Being satisfied. The Pool Netr™ with Stainless-Steel Screen (WHITE). Our standard product. With a tough and durable screen, this pool net should hold up great to usual wear and tear. (3-Year Limited Warranty on the frame). MSRP $29.95. The Pool Netr™ was featured in a story in The Bryan Times on August 27, 2014. Plastics Today wrote an article on the Pool Netr™ on October 23, 2014. We were featured in the Show & Tell section of the Service Industry News on November 15, 2014. We will be making an appearance in AQUA Magazine in January under the 'What's Hot' Products, and we expect to be included in the spring editions of Pools, Spas, & Patios (Canada) and Heart of Ohio Magazine.